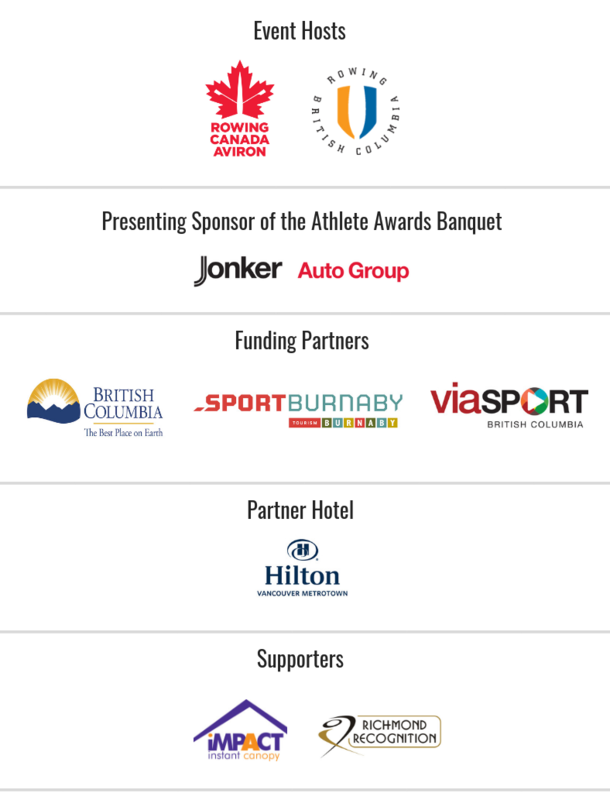 The Athlete Awards Banquet will be returning to the Hilton Vancouver Metrotown in Burnaby after the conclusion of the RCA National Rowing Championship and Canada Cup Regattas on Sunday, November 11, 2018. One of the best ways you can support the RCA National Rowing Championship and Canada Cup Regattas is to donate a table to our athletes. Your gift will help us provide many athletes with a meal at our Athlete Banquet – and as we all know, well-fed rowers are happy rowers! If you are a rower, crew or business that is looking for an extra-special way to give back to rowers, then please consider helping us by supporting a table at the banquet. You know the athletes will appreciate your support. We expect approximately 400 individuals to attend the Athlete Awards Banquet. The attendees will be athletes, coaches and volunteers from all over Canada and many local supporters from British Columbia. We have designed this opportunity to be as flexible as possible to enable all levels of donors from across Canada to be part of the event. If you and your crew want to support a table together, we can arrange to divide up the $500 donation/table goal amongst individuals. To support this event, simply follow the donation button above. Donations will be processed through RCA’s secure online system. To support an entire table, choose $500. To contribute to part of a table, enter your desired donation amount. Payment by cheque is also available. Contact sonja.lonne@rowingbc.ca for more details. ONLINE – click here to access Rowing Canada Aviron’s website to complete an online donation. BY PHONE – call 1-250-220-2538 to contact Kim Bell in Rowing Canada Aviron’s Finance Office. BY CHEQUE – mail a cheque to Rowing Canada Aviron (321 – 4371 Interurban Road, Victoria, BC, V9E 2C5) with “NRC Awards Banquet” in the memo line. We’ve raised $6825 so far thanks to donors like you from the rowing community. That’s enough for 136 athletes to attend the 2018 RCA National Rowing Championship and Canada Cup Regatta Athlete Awards Banquet! Is my gift eligible for a charitable tax receipt? Yes. Tax receipts will be provided for all donations over $20. Your tax receipt will be processed by RCA in January of each year (ie. If you donated in October 2018, you will receive your tax receipt January 2019). My organization would prefer to be a sponsor instead of a donor so we can have an enhanced presence at the event. Is this possible? Yes. You will not be eligible for a tax receipt. Many potential sponsorship opportunities are available related to this event. To discuss sponsorship opportunities, contact Rowing BC Executive Director, David Calder. I would like to attend the Athlete Awards Banquet. How can I get a ticket? More information about attending the Athlete Awards Banquet is available here. I’ve made my donation – how else can I help? We are still looking for volunteers! Find out more here. One of the most effective ways you can help is by sharing this page with others in the community who might be interested in donating! Is there anything else I should know about my donation? I am voluntarily and unconditionally donating the sum of $XXXX to Rowing Canada Aviron for the purpose of the 2018 RCA National Rowing Championship and Canada Cup Regattas Athlete Banquet. Consistent with the income tax interpretations of “qualifying donations”, this contribution is made voluntarily without any conditions and no benefit will accrue to me (or related parties) as a result of my donation. I confirm that this donation does not or will not reduce any obligation, directly or indirectly that I (or related parties) have for “non qualifying” expenses such as membership, training, or program registration fees, travel expenses or other like expenses that I would normally be required to pay to the recipient sport organization or any related or affiliated body. I also understand that civil penalties can be imposed against me for the misrepresentations of tax matters. Based on these facts, I understand that an official receipt for tax purposes will be issued. Sponsors are critically important to ensuring that this event can continue to grow and improve while limiting the financial commitment required from attending athletes. If you have the ability to get involved as a sponsor, please read the full 2018 Sponsorship Package here and contact Rowing BC Executive Director, David Calder.